Sometimes finding time for a date night can be harder than planning one. With kids, on top of career, on top of daily tasks, date night can grow further and further away from the reality of actually happening. If you don’t have kids, the financial strain can bring fun nights out to a screeching halt. Even living in New England can put a damper on going out. Last year, we got snowed in 5 times on scheduled date nights. To make it even funnier, we’ve had this article on the schedule for a year now to be released this Sunday, and what would you know, there was a snow storm last night. To say the least, we’ve had to learn how to get creative with date nights. In general, having a special night out with your spouse can become stressful. Who has time to get dressed up and find a babysitter anyway? But the beauty of kids is that they have a bed time. And with the comfort of home, you have everything you need for the perfect night in (even sans the cliché movie and popcorn night!). We’ve tried to make this recipe for the perfect night in as simple as possible with three easy to follow steps. 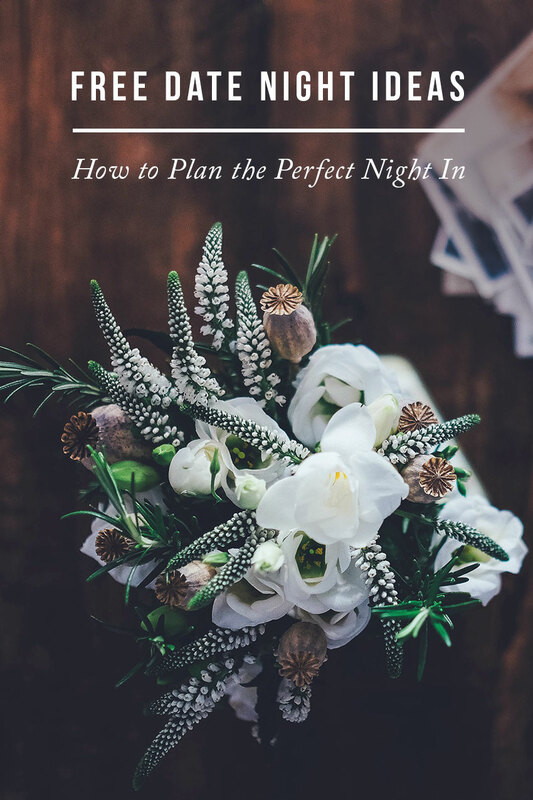 As cheesy as “setting the mood” sounds, this can really make the night special if you go over the top with it or flat if you don’t put the effort in and do it at all. Put some fresh cut flowers for the table (unless your like us and get caught in a blizzard). Break out the candles and put on some jazz music. If you’re not into jazz, Spotify has a ton of lists created for the perfect romantic dinner. Treat it like you’re going somewhere special. Lose the jeans and comfy tee and dress to impress. I’m talking about some cute heals to the girls and the best outfit you have in your closet, guys. Maybe putting on your tuxedo or wearing a beaded or sequined dress is uncomfortable and not such a good idea. But ladies, you can put on a cute, flirty summer dress (your staying in doors after all) and gents, find a nice button up in the closet. Another way you can make the night extravagant is with food! A nice bottle of wine with an over-the-top home cooked dinner is one of our favorite (and romantic) things to do. Check out our recipe for Filet Mignon with Bearnaise Sauce, Portobella Mushrooms and Vegetable Gratin or Oyster Mushroom Risotto with Scallops. Can’t cook? Don’t count out dining in just yet. Call a restaurant of your choice and get the meal to go. There’s nothing like sitting down in the dining room together with a candlelit dinner, and spending some quality time enjoying the food and each other. Take a walk down memory lane together and break out the wedding arsenal. Dust off the guest book and read through the names and any fun notes guests left. Break out the photo album and talk about every moment captured. Replay the wedding video and relive one of the happiest moments of your life. Turning off the Netflix or cable and putting down the phone gives you time to talk and bond. In general, the whole idea of this night is to quiet the outside noise and focus on each other. It’s not hard, you just need to make a conscious effort and carve out some time to have the perfect (and free!) date night in.